After World War II, Jack opened up his own repair garage on Pacific Coast Highway in Manhattan Beach. One of his customers was a man named Tony Parravano who inquired about the sprint car sitting on a trailer next to the shop. McAfee explained he races at local tracks and invited him come watch that night at nearby Carrell Speedway in Gardena. The next day, Parravano returned excited exclaiming “the sound…the sound”; he was hooked. 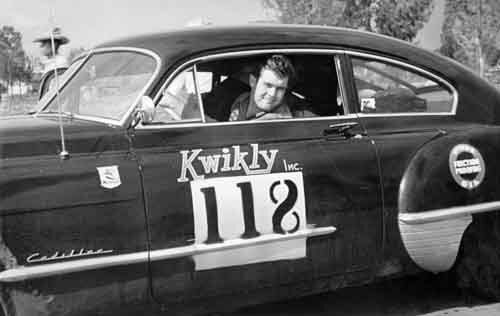 Parravano entered Jack in the first Carrera Panamericana in May 1950 using a 1949 Cadillac Sedanette 62. Fellow hot rodder buddy Ford Robinson was the co-pilot, and McAfee managed to finish in a respectable 10th place overall. Excited with the results, Parravano immediately bought a Jaguar XK120 and entered it at the Santa Ana Road Race; McAfee would finish 3rd overall. Hot rod friend Ernie McAfee (no relation) called Jack one day and asked if he could do an engine swap for one of his customers. Jack agreed and while working at Ernie’s shop on Cahuenga Blvd, he met wealthy sports car enthusiast John Edgar. Edgar was running a highly modified MG in local races with Bill Pollak driving. 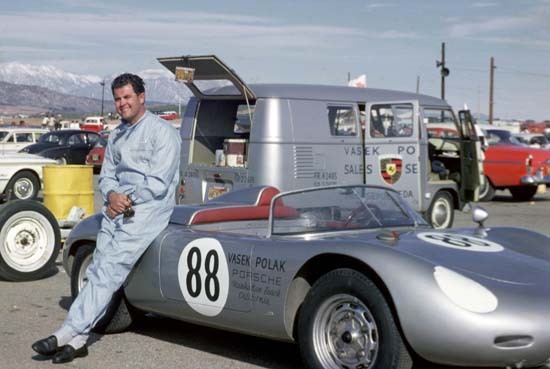 When Pollak couldn’t drive because of a schedule conflict, Jack was given the chance to drive at the nearby Palm Springs Road Races. Jack's 1st in class finish marked the start of a successful relationship with Edgar. Here’s Jack at Palm Springs in Edgar’s highly modified MG “88”. Road and Track magazine editor Henry Manny III bought this Ferrari 4.1 v12 340 Touring, but soon realized it was a bit “much” for him to drive. Edgar purchased it and soon after entered it in the Palm Springs Road Race on March 22, 1953. McAfee took the lead but was soon challenged by Bill Stroppe in a Kurtis Mercury. Jack took a chance on his tires holding and started using 5th gear on the main straight to maintain the lead. He was clocked at over 140 mph and won the race. In August of 1953, Parravano awoke Jack with a phone call in the middle of the night; he was in Europe and just purchased a 4.5 Ferrari for Jack to drive at the 1000km of Nurburgring. McAfee told Tony "If there's a ticket waiting at the airport, I'll go". When McAfee and Parravano arrived at the Ferrari factory to take delivery, Enzo said "Not so fast". He wanted to release the car after the race so that famed driver Alberto Ascari could hopefully earn FIA points for Scuderia Ferrari, and not Parravano. Enzo offered a compromise of McAfee co-driving with Ascari but Parravano stood firm on the principle he had already paid for the car. To no avail, the car wasn't released and Tony arranged for McAfee to drive a factory 2 liter Maserti shown below in the famous "Carousel" turn. The car was disqualified during a pit-stop when a mechanic was caught using a tool not belonging to the car's on board tool-kit. Wanting to return to the Carrera Panamericana, Parravano purchased a Ferrari 340 “America” Ghia coupe and entered it in the 1952 event. With friend Ernie McAfee as co-pilot, the privateers finished 5th overall; an amazing feat considering the Mercedes Benz factory team took the top 2 positions. Here's Jack(barely seen through the side window)driving the Right-hand-drive Ferrari. The windshield was damaged earlier by a rock and removed for the last day. 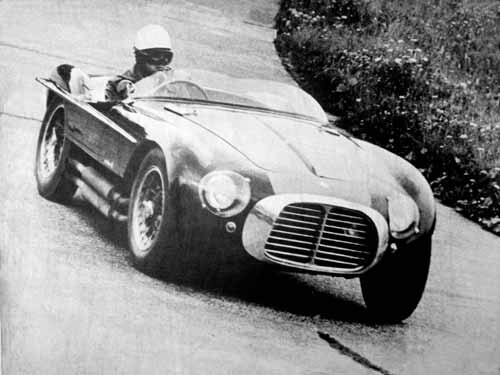 In 1955, McAfee expressed his frustrations to Edgar regarding the Ferraris with their lack of good brakes and adjustable suspension. He requested they add a Porsche 550 spyder so they could also run in the under 2 liter class. Edgar acquired a 550, and McAfee immediately fell in love with the car’s handling and ease of driving. 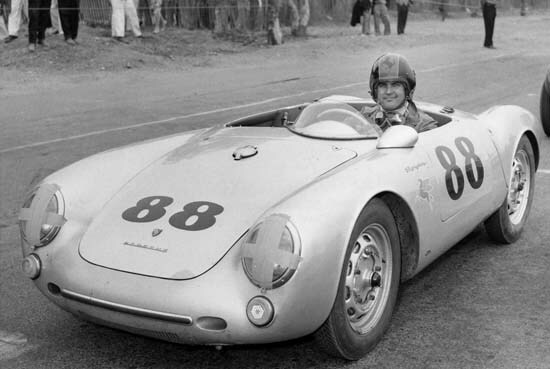 Here's McAfee at Torry Pines before one of his first races in the Porsche 550. One of the most "sexiest" Ferraris McAfee ever drove was Edgars 857; a 3.5 liter dohc 4 cylinder that Jack actually liked to drive. The only problem was the gearing was too tall for most of the West Coast events which led to average results. Here's Jack waiting on the starting grid at Palm Springs on Feb 26, 1956. In 1956, Edgar made a major commitment to acquiring a National Championship. 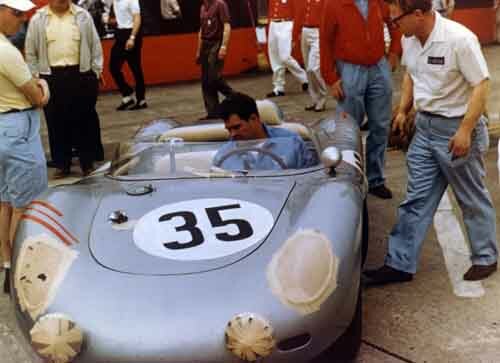 Carroll Shelby and McAfee (shown below) would both assault the SCCA National circuit driving Edgar’s Ferraris, with McAfee also focusing on the under 2 liter class in the Porsche 550. 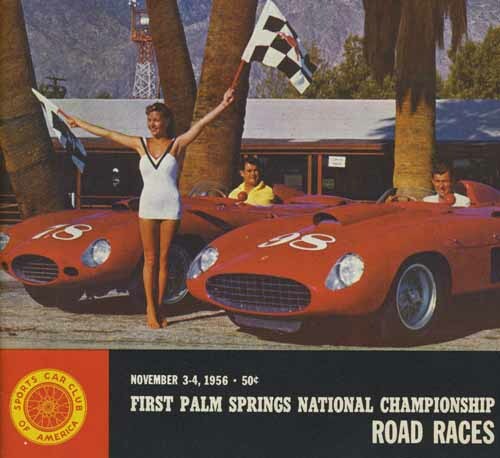 Here’s a nice shot of Edgar’s “boys” used as the cover of the Palm Springs Road Race program in 1956. As the year progressed, McAfee’s ability to run down bigger cars in the little Porsche led to his “Giant Killer” moniker in the East. By the end of the year, Edgar had achieved more than he hoped for; McAfee was crowned the National class F Champion, while Shelby earned the over 2 liter National title. After winning two national titles in 1956, Edgar sold most of his cars/equipment to Phoenix home builder Stan Sugarman. McAfee called upon his friend Vasek Polak once again to wrench on the ever so complicated 4-cam Porsche motor. 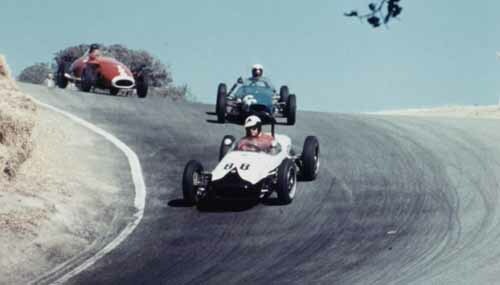 With 15 class victories and 3 main event wins, not even Ken Miles could beat McAfee for the West Coast title. 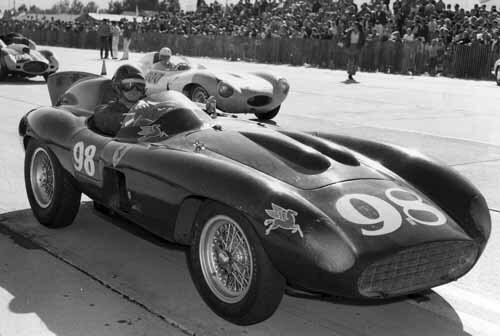 Here's a nice photo of Vasek doing a final once-over for McAfee at the 12 Hours of Sebring in 1959. 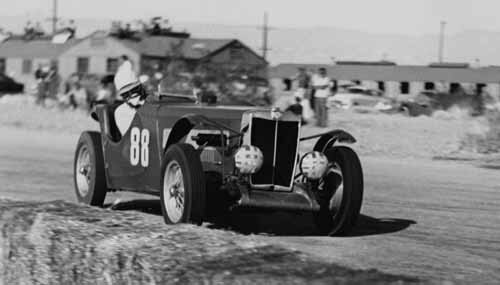 Another interesting car in the Stan Sugarman stable was the infamous “Pooper”; a Cooper race car that famed builders Troutman and Barnes fitted with a Porsche 4-cam type 547 motor. The car was originally owned by Johnny Von Neumann and driven by Ken Miles. Here’s a photo of McAfee during qualifying at Laguna Seca earning the pole position. Here's McAfee taking the checkered flag on a wet day at Pomona driving a Porsche RSK owned and tuned by Vasek Polak. In 1961, long time friend Harry Jones convinced Jack to to run another season with the emphasis on having fun. Harry bought and prepared a Lotus Formula Jr. and the two of them towed the car up and down the California coast. The last race of the year was at Laguna Seca, and McAfee needed to win to earn the west coast title. During practice, Jack felt just a slight hesitation in the motor and shut it down immediately; a main bearing had spun in the motor. The two of them fixed the motor in time for the race, but Jack had to start from dead last. By the time the checkered flag fell, McAfee had worked his way up to first place and earned enough points to win the 1961 Pacific Crown. McAfee only ran a few events in 1962, one of which was Riverside CA in May. Piloting the RS60 of Vasek Polak, Jack took the under 2 liter class win.